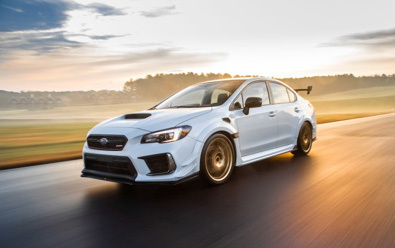 Tokyo, January 15, 2019 – Subaru Corporation announces that its wholly-owned motorsports subsidiary, Subaru Tecnica International (STI)*, today introduced the STI S209, first-ever STI “S-line” performance vehicle sold in the US at 2019 North American International Auto Show. Based upon WRX STI performance sedan, STI has exclusively tuned the various components of the vehicle including engine and chassis, and added exclusive parts to exterior and interior to develop this special model, S209. 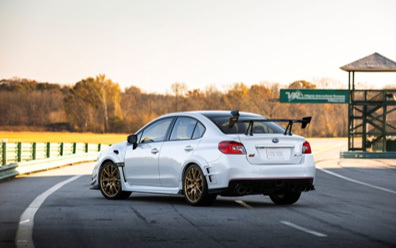 The S209 was developed with STI’s goal to offer “the speed that can only be felt when the driver is in complete control of the vehicle” and achieved the driving performance extensively improved over the standard WRX STI. To date, STI has launched 2018 WRX STI Type RA and 2018 Subaru BRZ tS as STI tuned performance vehicles for U.S. market, but this S209 is the first “S-line”, the top tier of STI tuned models, ever sold in America. The EJ25 turbo engine inherited from standard U.S. model WRX STI has been exclusively tuned to deliver the optimal power output that a driver can accelerate the vehicle with confidence, in any driving situations. To feed more air to this engine, the S209 uses high-flow air intake system featuring an exclusive intake duct and induction box with conical air filter. The air is then led to the exclusively designed turbocharger with a larger turbine and compressor. The vehicle’s exhaust system is equipped with high-performance mufflers with larger exhaust tips for less airflow resistance. Controlled through STI-tuned engine control unit, the powertrain delivers an estimated 341 horsepower, the highest output ever in the STI tuned models. The model also features an intercooler water spray system to lower intercooler temperature. The engine also utilizes forged pistons and connecting rods to secure reliability as production model. The S209 wears 265/35R19 tires wrapped around lightweight 19×9-inch forged BBS alloy wheels. Underneath the S209’s broader body with bulging fenders are specially developed Bilstein dampers, dedicated coil springs and stronger pillow-type bushings. Further, the S209 incorporates a flexible front-strut tower bar and flexible front and rear draw stiffeners, the items proven with the class winning Nürburgring racecar, and carbon-fiber roof which contributes to weight reduction and higher body rigidity. Additional exterior parts such as STI front, rear and side under spoilers, STI front bumper canards and STI carbon-fiber rear wing bring the better aerodynamic performance and the vehicle achieves the better handling performance with these enhancements. With available two exterior color/BBS wheel combinations, WR Blue Pearl/dark gray wheels and Crystal White Pearl/gold wheels, the STI S209 will be sold through the U.S. Subaru retailers in late 2019. In its mid-term management vision “STEP”, Subaru aims to “build a strong brand” and plans to enhance the lineup of “sports models including STI models” in its product launch direction. The S209 is introduced as part of Subaru’s initiative to enhance the STI brand in the company’s largest U.S. market. Subaru will continue to aim for building a strong brand and enhance its initiative to strengthen a prominent and unique product lineup.